This Chili’s Copycat Monterey Chicken recipe takes minutes to prep. Then, sit back and relax while the chicken smothered with barbecue sauce, bacon, tomatoes and cheese bakes to perfection. It’s a copycat of Chili’s Monterey Chicken. 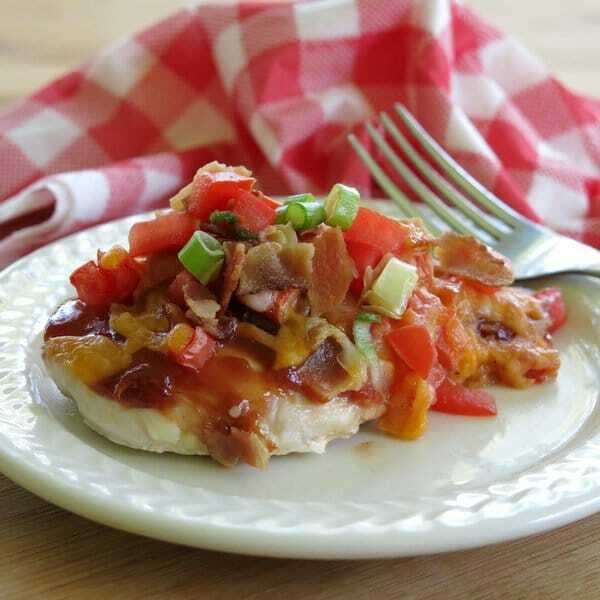 Boneless, skinless chicken is coated with barbecue sauce, topped with bacon and, of course, Monterey Jack cheese. Fresh tomatoes and green onions finish this beauty. When I announce that we’re having Monterey Chicken for dinner, I get a hugs, smiles, thank you’s…I’m elevated to hero status…at least until it’s time to do dishes. It’s a nice feeling. Everyone needs a few of these recipes in their life. It takes minutes to prepare and then it’s all hands-off cook time. Perfect for entertaining. It tastes just like Chili’s recipe by the same name, but you can enjoy it in the comfort of your home, any time you want! My other “specialty” dish, as the family calls it, is Alice Springs Chicken. Even though the flavors are very different in each recipe, the easy preparation and unique flavor combinations make them feel like close cousins. If you feel like eating out, but don’t feel like dining out and you don’t feel like spending a lot of time in the kitchen either, these recipes have your back! 1. Place boneless, skinless chicken breasts in a baking dish and spread your favorite barbecue sauce over the top of each piece of chicken. Use a low-sugar version to keep the dish low-carb. 2. 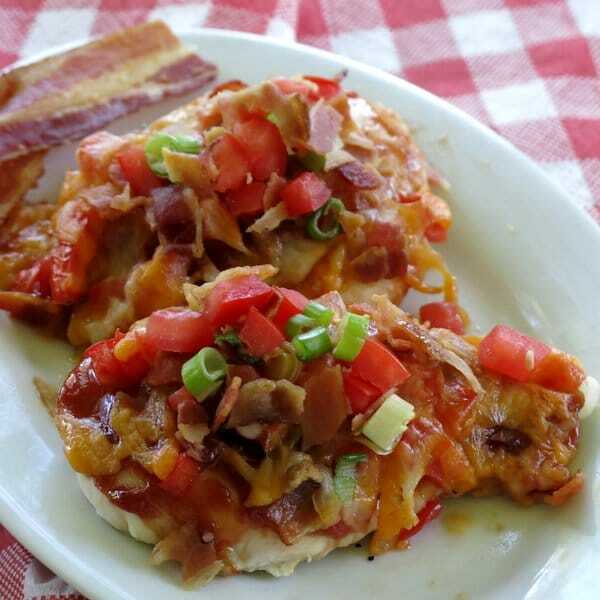 Top the chicken with a sprinkling of traditional bacon or turkey bacon. 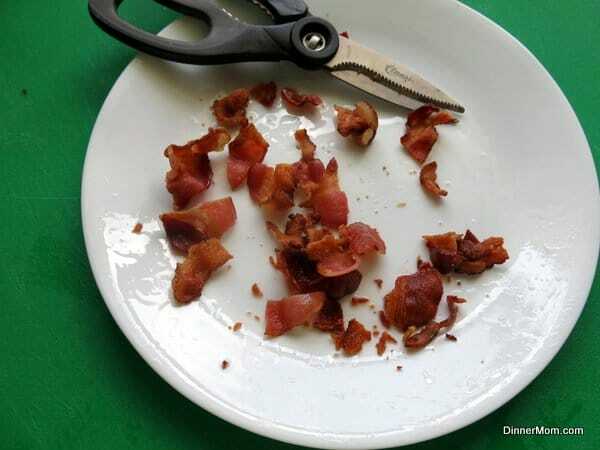 Use large pieces of bacon or crumbled pieces. I find smaller pieces are easier when cutting the finished chicken dish. For the easy prep version, cook bacon in the microwave oven. Place several sheets of paper towels on a microwave-safe plate. Place slices of bacon on top of the paper towels and cover the bacon with several more paper towels. Cook bacon for about 3 minutes and then crumble by hand or with cooking shears. 3. Layer chopped tomatoes on top of the bacon. Plum or roma tomatoes are easy to work with. If using diced tomatoes that are canned, drain them first. Putting tomatoes under the cheese ensures tomato goodness in almost every bite! 4. Top the chicken off with shredded Monterey Jack cheese and bake! If this is the first time you’ve tried Monterey Chicken, you’ll wonder why you’ve never tried it before. If you’ve had it before, then you may wonder why you have never tried this at home! 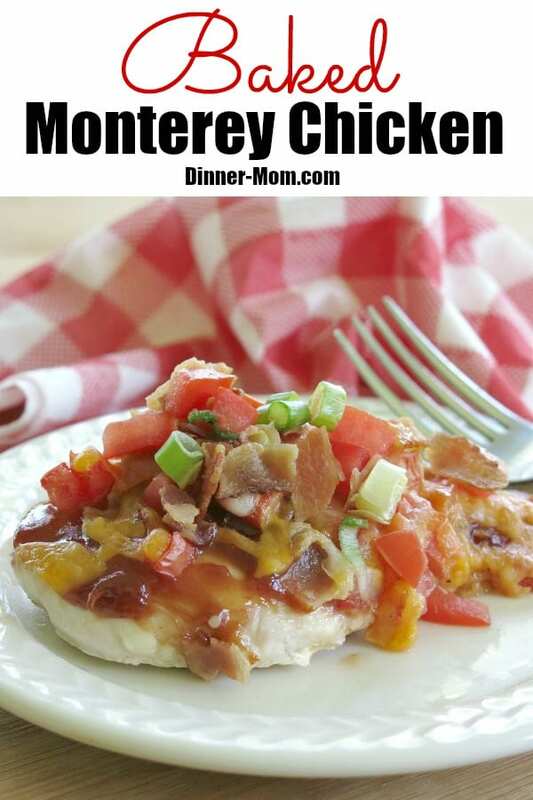 Chili's Copycat Monterey Chicken recipe takes minutes to prep. 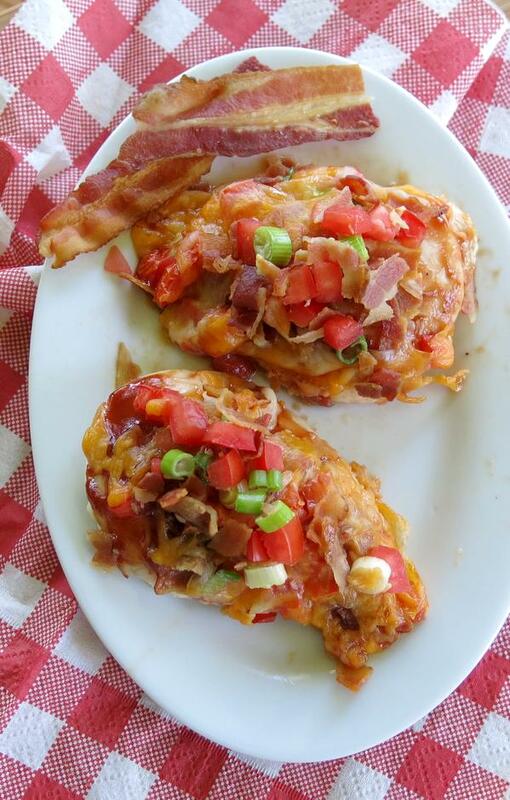 Then, sit back and relax while the chicken smothered with BBQ sauce, bacon, tomatoes and cheese bakes to perfection. Place chicken in a baking dish and cover with barbecue sauce. Top with bacon, tomatoes and cheese, reserving a little of each for garnish if desired. Bake, uncovered, for 30 minutes or until internal temperature reaches 165 degrees F and chicken is cooked through. Garnish with green onions and other toppings if using. To keep this South Beach Diet Phase 1 and low-carb friendly, use turkey bacon, low-sugar BBQ sauce and low-fat cheese. I love this chicken at chili’s!! So excited to make it at home! always looking for new chicken recipes. I just found dinner! 🙂 We have all of the ingredients to make this TONIGHT! I can see why your family gets excited when you make this dish. I’ve never tried this at Chili’s, but definitely want to try it at home! Well don’t mind if I do! I’ve never had this before, but I do love bacon! Who doesn’t, right? Perfect meal for a summer dinner on the back patio! I pretty much love everything with bacon, including THIS :)!! Wow I love all the flavors going on here! Mouth watering! I love the use of barbecue sauce to your topping. Sounds wonderful! What a great easy dish! love the colors and flavors! This looks so yummy! And super easy AND healthy! A must! This sounds like such an easy, flavoursome dish! 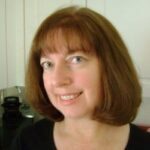 Great tips for keeping it simple too, though I’d never cook bacon in the microwave! It looks similar to hunters’ chicken. Yummy. This looks so delicious! I can’t wait to make this for my hubby and the hero! Great recipe! OMG you have me drooling here! This is better than pizza, if I may say so! I’ve never had Chili’s version but I love how easy you make it look! I actually made this tonight, it was easy to throw together for a busy weeknight meal. I used canned diced tomatoes with green chilies (drained) as that’s what I had on hand. Didn’t have green onions, didn’t miss them. There was alot of liquid when it was done, it was just meh for me. Thanks for your feedback. You have to be a fan of BBQ flavor for this one. If you have extra sauce, then spoon it over the top!